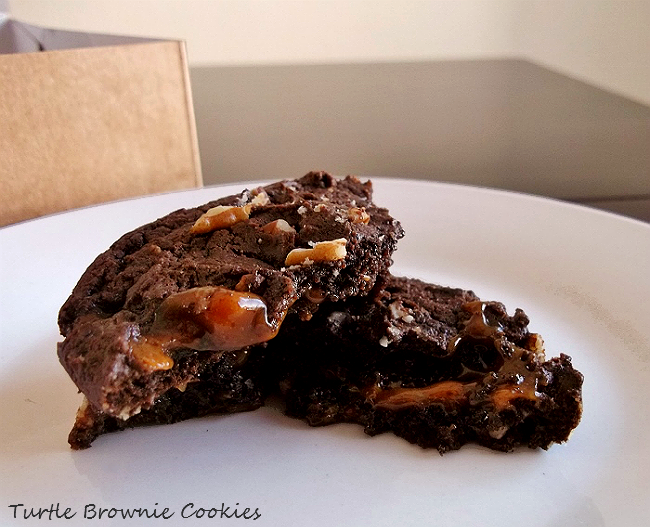 Momma Told Me: Turtle Brownie Cookies Now Served In A Grocery Bakery Near You! 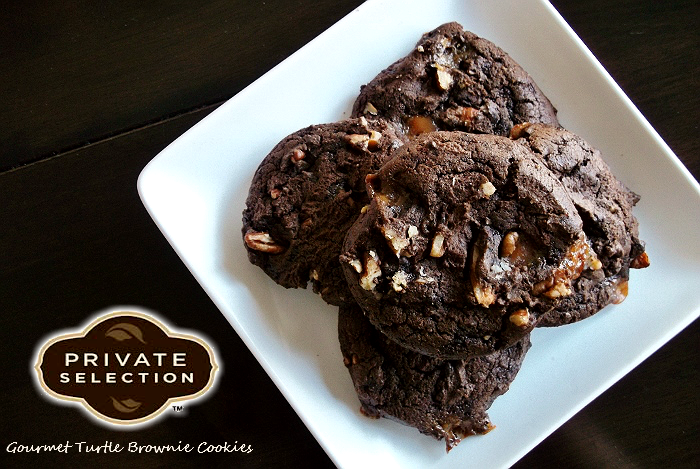 Turtle Brownie Cookies Now Served In A Grocery Bakery Near You! Momma Told Me: Have some cookie with your ice cream. Fresh baked goods hit the spot all year-round, but few things satisfy like a warm cookie and a cold glass of milk; or Cookies 'N Cream, or Cookies and Ice Cream. In our house all three are a big late night indulgent for the other half. Somewhere between an hour to two after the last fork had been set on a plate, just as dinner has settled, a craving kicks in for something indulgent and sweet. And, since we only enjoy 'dessert' on Mondays and Fridays, per our 2013 instated health goals, the more sinfully indulgent, the better. So, when Kroger asked me, as a BzzAgent, if I wanted to try yet another Private Selection product, I was ecstatic to learn said product was a range of gourmet cookies. Unfortunately, there was some initial disappointment when I hit the bakery department and saw only two of the four varieties were available, neither of them allergen friendly; White Chocolate Coconut Almond and Turtle Brownie. At just around $5 a box for 6 cookies, these were certainly priced at gourmet, and the most expensive snack per weight or pieces in the boxed fresh baked department. 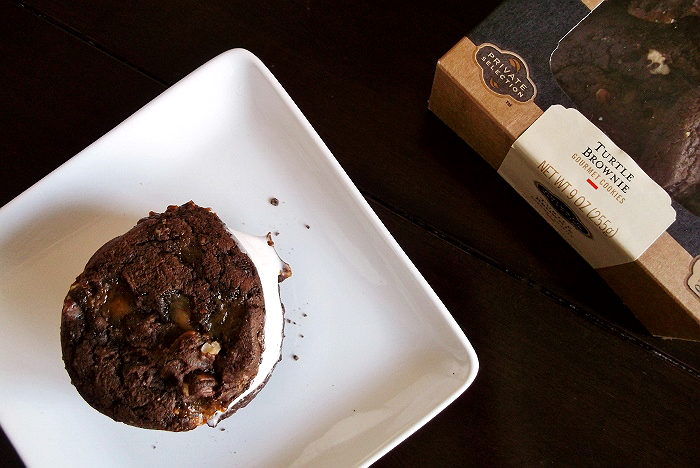 It appears these gourmet Private Selection cookies are also likely baked in house and packaged regularly, as many of the Turtle Brownie cookies had ribbons of bubbled over caramel that had oozed out, and were not very picturesque in shape. Filled with gooey caramel and pecans, and the stronger of the two options for ice cream sandwiches, we picked up two boxes (yes, I bought a second box) and headed home to enjoy an afternoon treat. To be honest, we'd expected more of a n aroma when we lifted that Private Selection box, and certainly for the cookies to be softer; like a Pepperidge Farm treat. Unfortunately, perhaps due to the caramel, these were quite stiff, though not crumbly. I popped a Turtle Brownie Cookie in the microwave for 15 seconds on High and we were soon back in business. Not only was there now a wonderful aroma wafting through my home, but the softened cookie was just as enticing as if it had been pulled right from the baking rack at the store. The texture was chewy, like a brownie, and worked splendidly with the chunks of pecans for extra texture. A few times I even experienced some caramel running down my face. Since these particular Private Selection cookies were a bit stiff, they didn't work too well as ice cream sandwiches, like I'd planned. The cookies hardened even more with the chilly ice cream between them, and the caramel acted as a glue to keep the cookie from snapping beneath a bite. 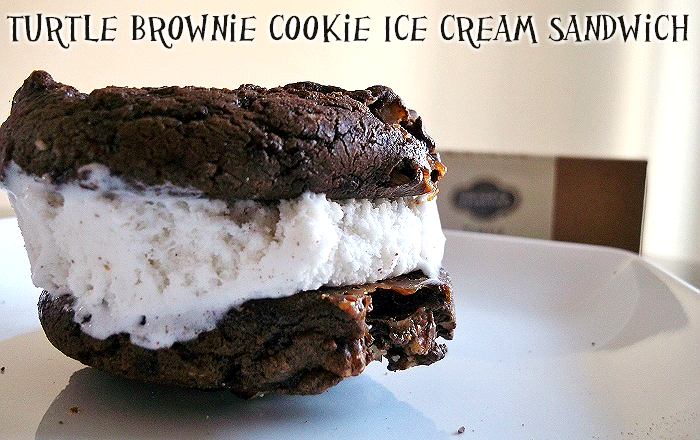 The sandwiches were soon deconstructed for cookie sundaes. Sabrina especially liked that these store bought cookies looked 'home made,' though, as a consumer, I rather found this slightly less premium for the price. 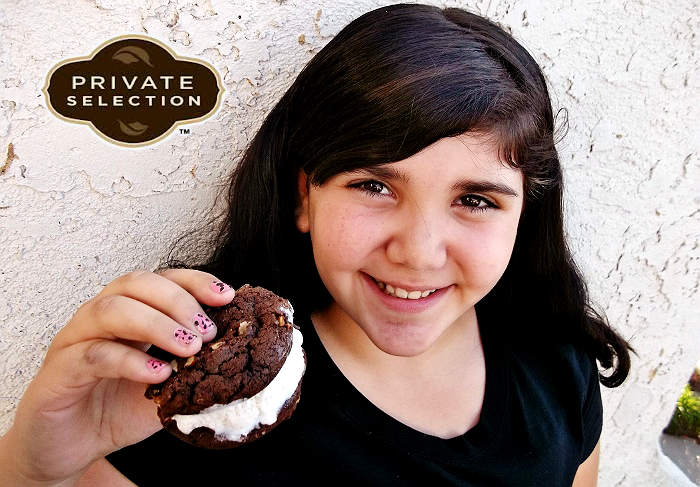 Private Selection has two other varieties I'm trying to hunt down; White Chocolate Macadamia and Ultimate Chocolate Chunk. In all, the cookies hit the spot, but the price point was a little too high for something being prepared by employees with varying quality control. I'd be happy to indulge in box for around $3.75-$4. I need ALL the cookies!!! Yum!!! But now I want turtle cookies and ice cream. Thanks for that. Your blog posts always leave me drooling. That looks so amazing. I want one!